Visual representations of data are one of the most effective means of conveying complex information and D3.js provides great tools and flexibility to create these data visualizations. In this tutorial, we'll explore how to build a realtime graph with D3.js and Pusher Channels. If you want to play around with the code as you read this tutorial, check out this GitHub repository, which contains the final version of the code. You also need to have http-server installed on your machine. It can be installed through npm by running the following command: npm install http-server. As you can see, the HTML file is just pulling up the styles and scripts we need to build the graph. We're making use of D3.js to build the chart and Pusher to add realtime functionality. The app.js file is where the code for the frontend of the app will be written. Head over to the Pusher website and sign up for a free account. Select Channels apps on the sidebar, and hit Create Channels app to create a new app. Once your app is created, retrieve your credentials from the API Keys tab, then add the following to a new variables.env file in the root of your project directory. Now that we've installed the relevant dependencies and our Pusher account has been setup, we can start building the server. Save the file and run node server.js from the root of your project directory to start the server. // Select all bars on the graph, take them out, and exit the previous data set. In the code block above, we've created a basic bar chart using the initial data received via the /poll endpoint. If you're familiar with how D3 works, the code should be familiar to you. I've added comments in key parts of the code to walk you through how the chart is constructed. I'm using http-server here, but you can use whatever server you want. You can even open index.html in the browser directly. Let's make sure that updates to the poll can be reflected in the app's frontend in realtime with Pusher Channels. Paste the following code at the end of the app.js file. Here, we opened a connection to Channels and used the subscribe() method from Pusher to subscribe to a new channel called poll-channel. Updates to the poll are listened for via the bind method, and the update() function is invoked with the latest data once an update is received so that the graph is re-rendered. Don’t forget to replace the <your app key> and <your app cluster> placeholders with the appropriate details from your Pusher account dashboard. We're going to simulate a poll that updates every second and use Pusher to trigger an update when the data changes so that subscribers to the poll (the client) can receive the updated data in realtime. The /poll route sends the initial poll data to the client and calls the updatePoll() function which increments the votes for a random club at three second intervals and triggers an update on the poll-channel which we created on the client in the last step. Kill your server and restart it by running node server.js from the root of your project directory. At this point, you should have a bar graph that updates in realtime. 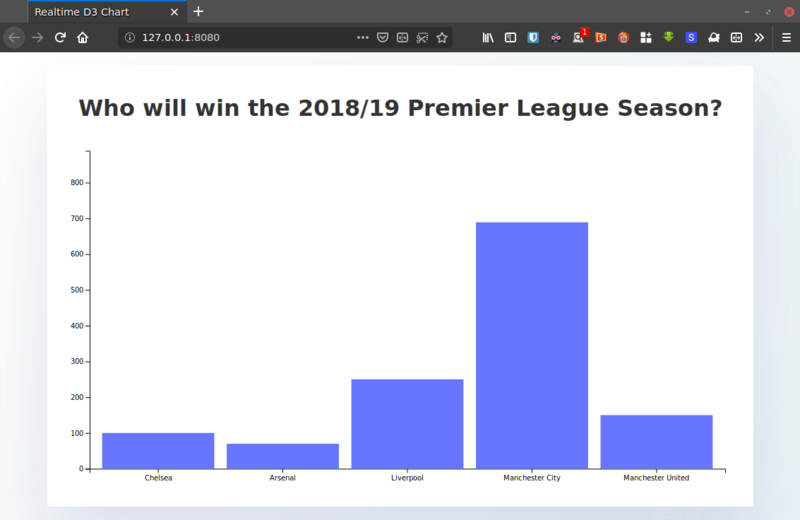 You have seen the procedure for creating a bar graph with D3.js and how to it in realtime with Pusher Channels. It was easy enough, wasn't it? We have covered a simple use case for Pusher and D3 but one that's only scratching the surface. I recommend digging into the docs to find more about Pusher and other awesome features it has. Thanks for reading! Remember that you can find the complete source code for this tutorial in this GitHub repository.